Optimization is the act of making the best or most effective use of a situation or resource. As consumer behavior and technology changes, we must focus on digital branding optimization to ensure we are meeting the needs of our audience. This article will outline 3 tips for digital branding optimization. Use these tips to get more customers, clients, and leads. Optimization plays a major role in how we do business and live our lives. Whether it’s analyzing our business for inefficiencies or going to the doctor for a checkup, we naturally try to optimize all aspects of our lives. Simply put, if we don’t optimize, we don’t get better. Regardless if you have developed a few pieces of your digital brand or have fully established one, you need to focus on digital branding optimization to effectively grow your brand and connect with your audience. Digital branding is about establishing your brand’s story and presence in the digital space. It is the key to establishing a meaningful connection with your target audience. It’s about using your unique proposition to differentiate yourself and your offerings from the competition. As you begin the process of digital branding optimization, you must understand the components of your digital brand footprint. 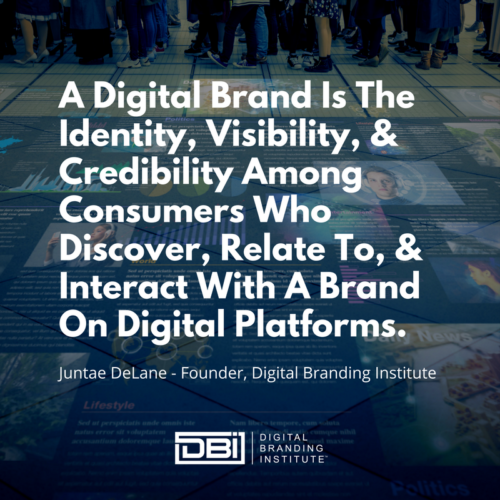 A digital brand footprint is a visual map of how and where a brand lives online, where target groups spend time online, and how these properties are or are not connected via brand behavior and communication. Specifically, your hub paid/owned/earned platforms, and overall brand health makes up your digital brand footprint map. The Hub – Where we ultimately want consumers to find us and what we want them to accomplish while they’re there. Owned Platforms – Digital Beachheads That The Brand Has Either Built or converted and their relative traffic. Earned Media – The Current Means, Volume, Sentiment, and Substance of Consumer Brand Mentions. Brand Health – Visitation, Update Frequency, Interaction Levels, Audiences, and Interconnectivity. It doesn’t matter who I’m working with. Whether I’m working with an individual looking to build their business or a large company looking to enhance their digital brand, what I often find is that people continue to create more and more content. They believe the more content they create, the better the chance they have to connect with customers. And they find themselves stuck on the content creation hamster wheel. The need to continuously publish content often leads to brands creating content for content’s sake. They publish time after time and hold vanity metrics such as views and shares in high-regard. If one piece of content does not garner enough attention, they attempt to create one that will. This activity is detrimental to your brand as it will condition you to create content that based on your brand’s objectives and not your consumer’s. This is the very reason why you should use data to create content from the beginning. Well, start with the data that you’ve collected on your target audience and then create content around their wants, needs, and challenges. For example, the questions that your audience ask via social media, the information was given to a call center representative, or things you overhear customers mention about your brand are all considered data points. Use these to fuel your content creation process. This digital branding optimization tip will increase conversions and brand reach as it focuses more on your audience and not your brand. DBI TIP: If you find yourself creating content specifically for a campaign, you should determine if the campaign itself is based on consumer objectives and not solely on the brand. If you notice your brand’s content is missing the mark or not getting the level of engagement you seek, try showcasing more of your brand personality. As the adage goes, people like to do business with people they know like and trust. As brands engage with consumers in the digital space, they are expected to showcase more brand personality. At the end of the day, personality is what makes a memorable connection. Right? For instance, if you’ve ever watched a reality show and noticed there’s always one person that attempts to overrun the show with their outgoing personality. Some of us may find them annoying but many somehow seem to make it to the next season or (even better) have their own spin-off series. If you are looking to showcase more brand personality, I would focus on your objective, your promise, and (of course) your personality. How will you be transparent? It is expected that brands are transparent when communicating on social media. So, in what ways do you think your brand can open up more and let your target audience understand you, your business processes, and the person or people behind the brand? After you have engaged with your audience, how are you going to express your promise of helping the consumer? Similar to in the physical world, in the digital space sometimes people just aren’t inviting. They may have a voice that isn’t warm and welcoming. When asked a question, they may respond in short fashion and not elaborate to ensure the person understands. Ultimately, your digital brand voice should be the opposite. Consider personality the window to the soul of your brand. It provides your audience with a glimpse of who/what your brand is and the relatability of your engagements. Ultimately, being relatable is the goal. Your brand’s tone of voice enhances your brand story. It distinguishes you from the competition by providing unique engagements with consumers. It makes you human, which allows you to cut through the clutter while simultaneously building authority. It also puts you at the forefront of digital communication by incorporating human interaction in the written text your customer will most likely consume before contacting your organization. If you noticed your reach and visibility on Facebook is less than optimal during your digital branding optimization efforts, please keep reading. It is important to note the Facebook Newsfeed change will affect your visibility as promotional messages are inhibited from being displayed on user’s Newsfeeds. Facebook has allowed brands the opportunity to reach niche consumers with marketing messages within a matter of minutes. As a result, brand posts on the network have sky-rocketed. Facebook understands this uptick in brand posts and is taking action. Mark Zuckerberg has built a billion-dollar empire that provides a WAY for brands to advertise but cannot dictate HOW brands advertise. We’ve heard from our community that people are still worried about missing important updates from the friends they care about. For people with many connections this is particularly important, as there are a lot of stories for them to see each day. The biggest threat to Facebook is probably the brand’s that advertise on the network. Brands are taking over Facebook like the undead during the zombie apocalypse. Like zombies, brands have started to consume the lives of Facebook users by incorporating brand messaging into the Facebook Newsfeed. Facebook differentiates between organic promotional posts and those that are paid ads, saying that ad content is controlled, so users are “used to” a certain amount of ads on their newsfeed. However, when page owners push a lot of promotional content in their organic posts, it can be a turn-off to fans. So, when executing your digital branding optimization, check to see if your brand messages and engagements can showcase more of your brand personality. and Likes: Brands tend to have Facebook pages with lots of likes. Produce Content on Brand’s Expertise. A brand’s content makes it easier for search engines to understand the brand, and allows the brand name to be associated with the search. Get Press Coverage. Similar to human perception, search engines will also perceive someone as an authority if the press mentions the brand. Become A Guest Contributor. This tactic is a way to generate traffic, brand impressions, and build trusted signals that search engines can use to gauge your site’s importance and expertise. Build Your Social Media Following. One of your brand’s biggest sources of branded signals is the activities that take place on social media. What types of signals might Google employ to determine if a site is a “brand” or not? When you conduct your digital branding optimization execution and find that your visibility is less than optimal, be sure to implement some of the aforementioned tips to enhance your visibility within search engine results. Digital branding optimization is a great way to discover how your target audience is interacting with your brand. It provides an indication of their experience being converted from a prospect to a customer. And great marketers know, until you truly understand your customers you’ll never be able to market to them effectively. So, instead of analyzing, tweaking, and optimizing our communications. Let’s start focusing on our consumers, and let that relationship drive our campaigns. And a great way to do this is through digital branding optimization.